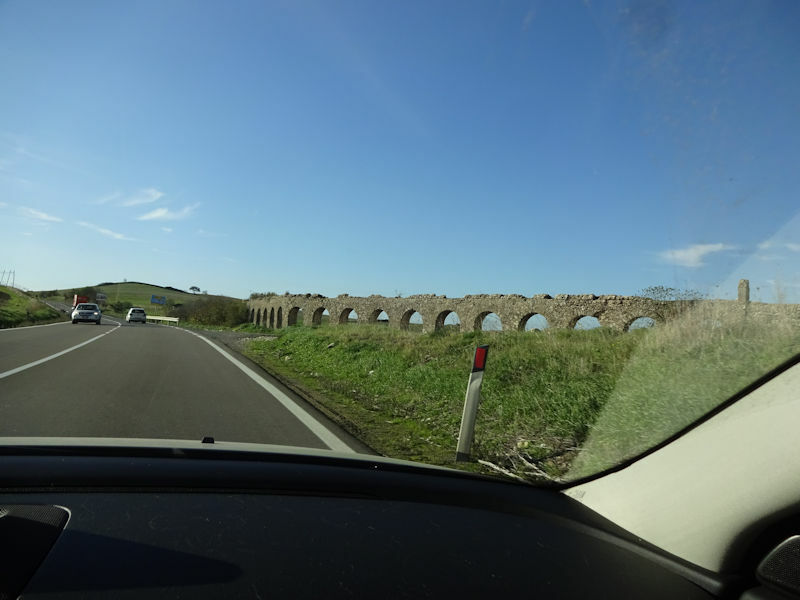 We're on the beautiful Strada Statale SS1bis ("Via Aurelia") between Monte Romano and Tarquinia on the coast, 1 December 2016, and here's a Roman aqueduct in remarkably good condition. 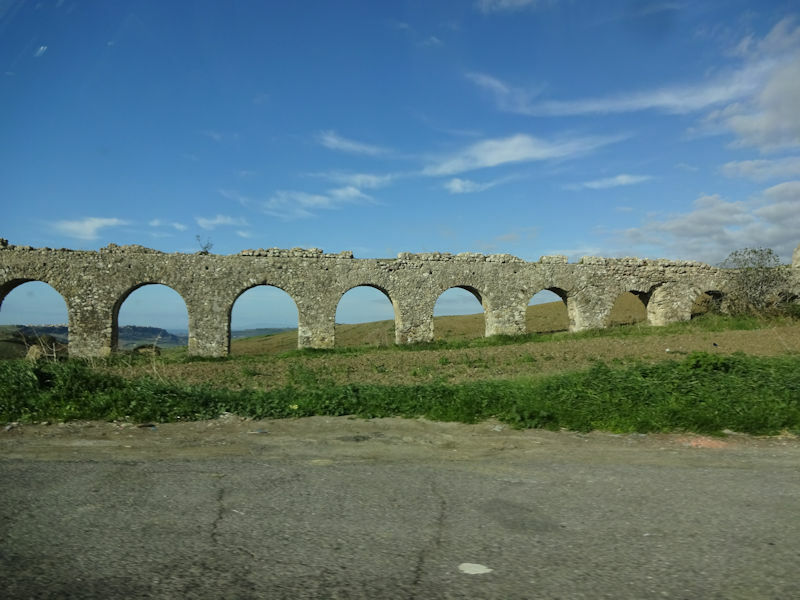 And no wonder: we learnt later that it's the Acquedotto delle Arcatelle, Aqueduct of the Arches, and was built in the 18th century "in the Roman style". 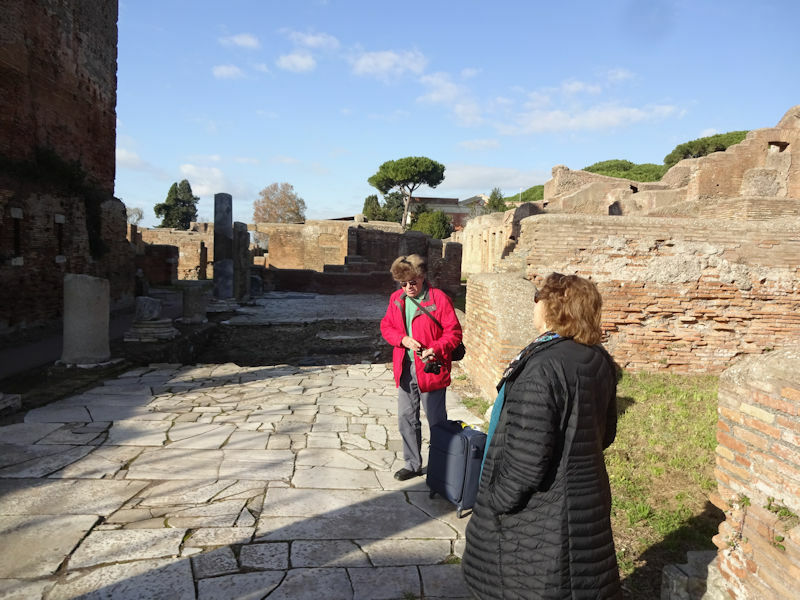 We've just been to the Da Vinci Airport in Fiumicino to fetch our friend Juan Carlos and now we're entering the excavations of Ostia Antica, 5 or 6 km to the south. 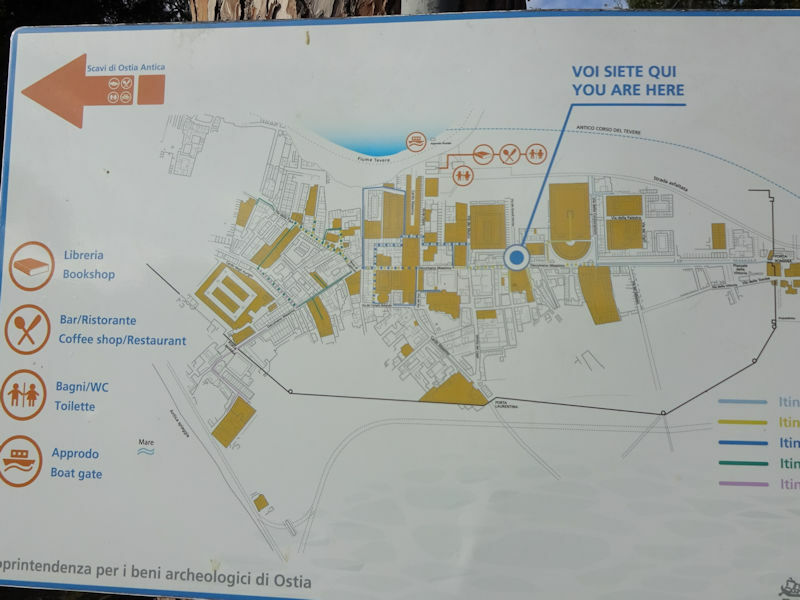 A helpful map of the site -- we're entering at the right end and proceeding leftward into the old city centre. 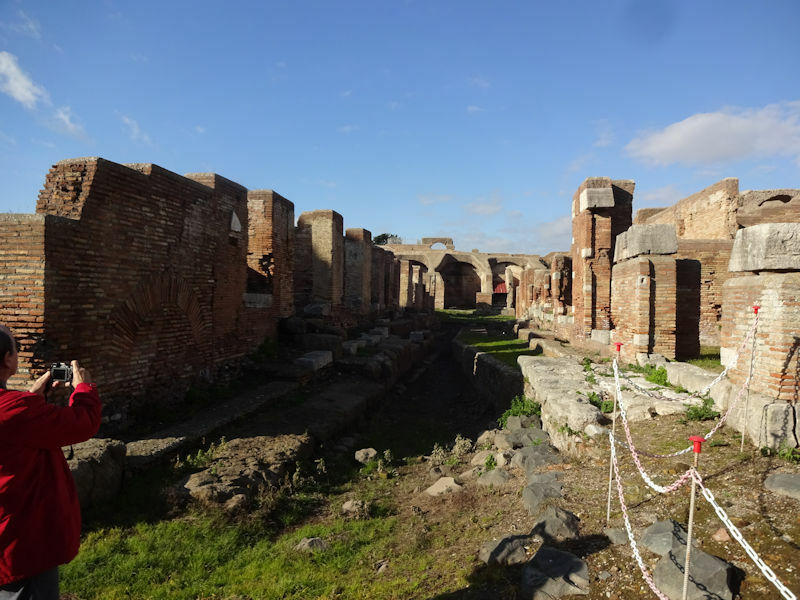 Ostia, in its heyday at the mouth (os) of the river Tiber (or Tevere), was for a long time the commercial port of the city of Rome 30km upriver -- what with one thing and another, the coastline is presently about 5km westward from the old warehouses and customs houses. 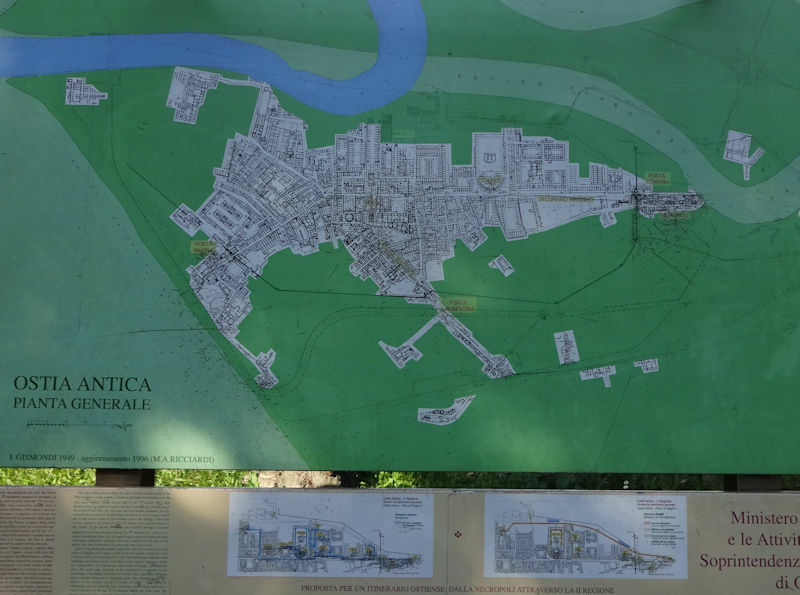 On the map, the modern Tiber (since a late-16th century flood) is shown in blue, and the course of the Tiber in Roman times is shown in a faded green, called the Fiume Morto or Dead River. 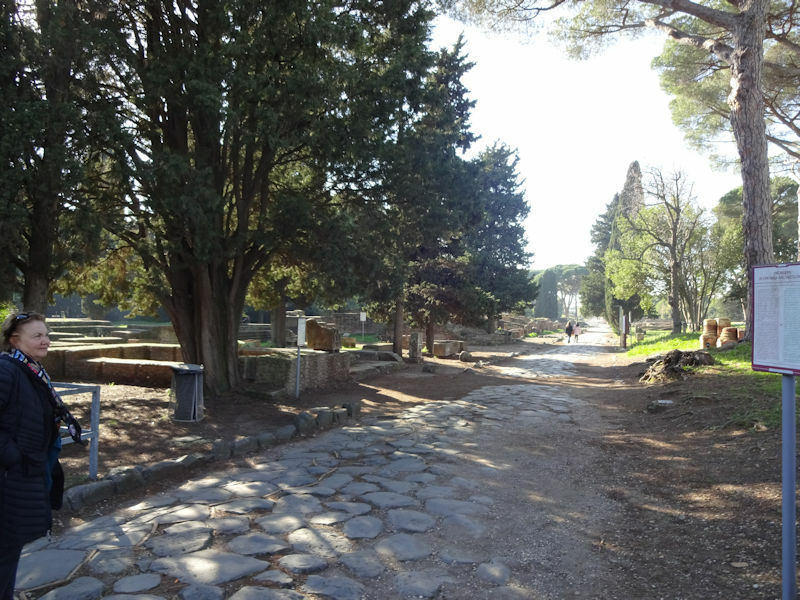 We're marching along the Decumanus Maximus, or east-west high street, through the necropolis or monumental cemetery outside the city walls. 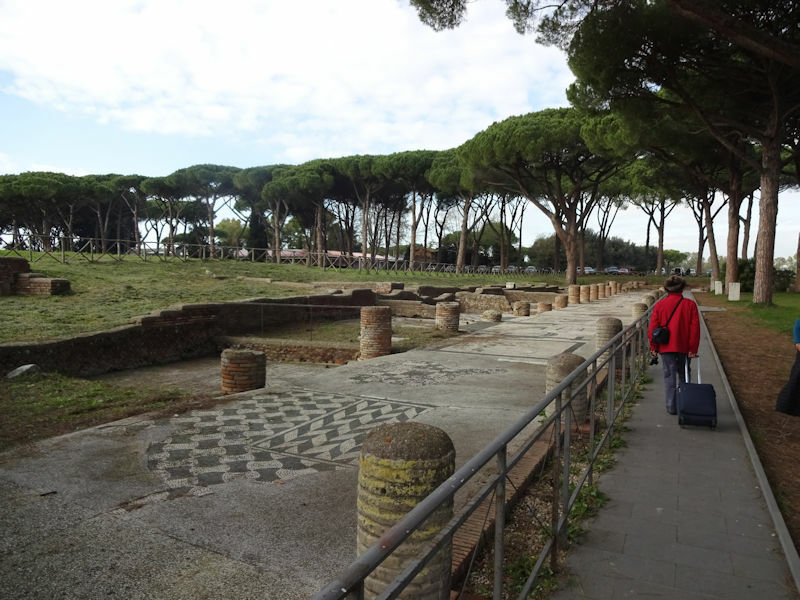 Aside from pre-Romans working local salt pans perhaps as early as 1400 BC, Ostia seems to have begun life as a military stronghold (castrum) in the 7th century BC, but archaeologically speaking, the oldest finds are from the 4th century BC, and the remains of the Roman castrum from the 3rd century BC have been found near the later Forum. 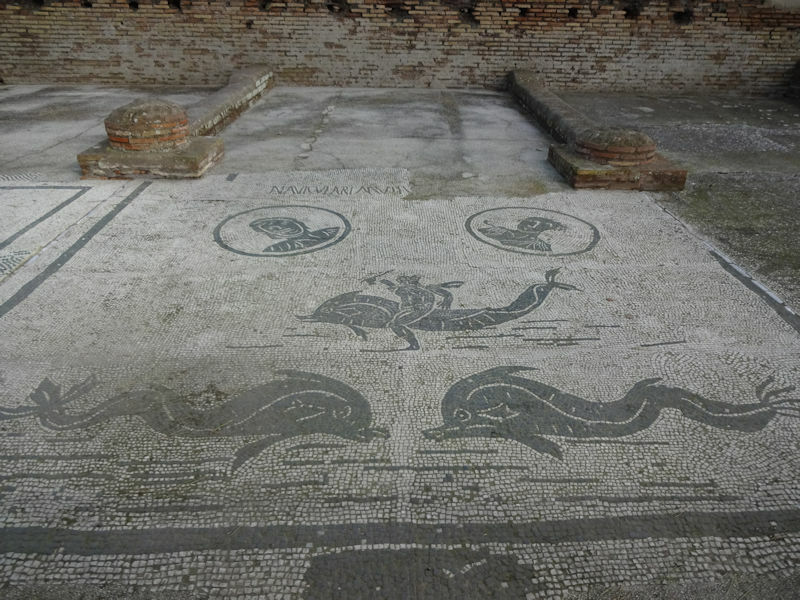 Mosaics that were part of the complex of public baths. 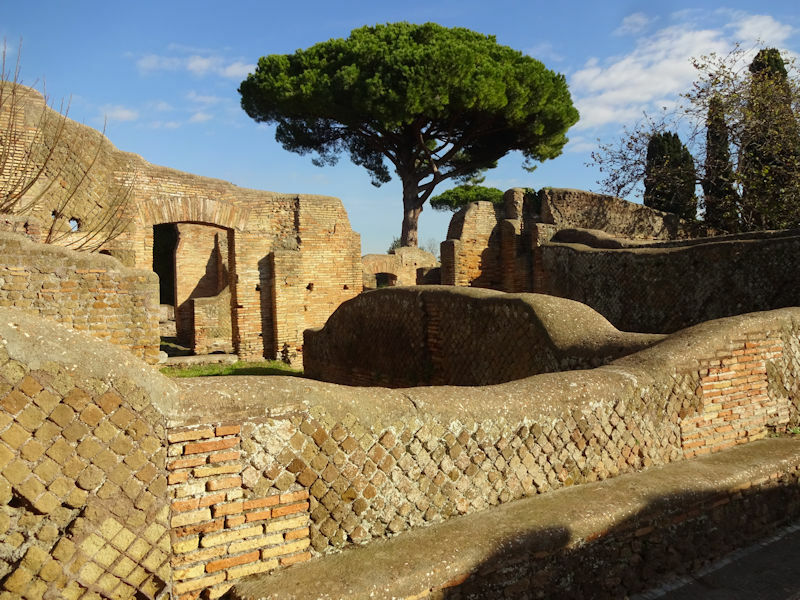 The tourist site of Ostia Antica (as distinct from the present suburb of Ostia on the coast to the south) has got a mass of well-preserved buildings and city layout, a theatre, public baths, a firehouse, taverns, and what's described as the earliest synagogue in Europe, as well as mosaics and frescoes, a museum, and an attractive cafeteria-style restaurant that serves up a very nice microwaved pasta lunch. 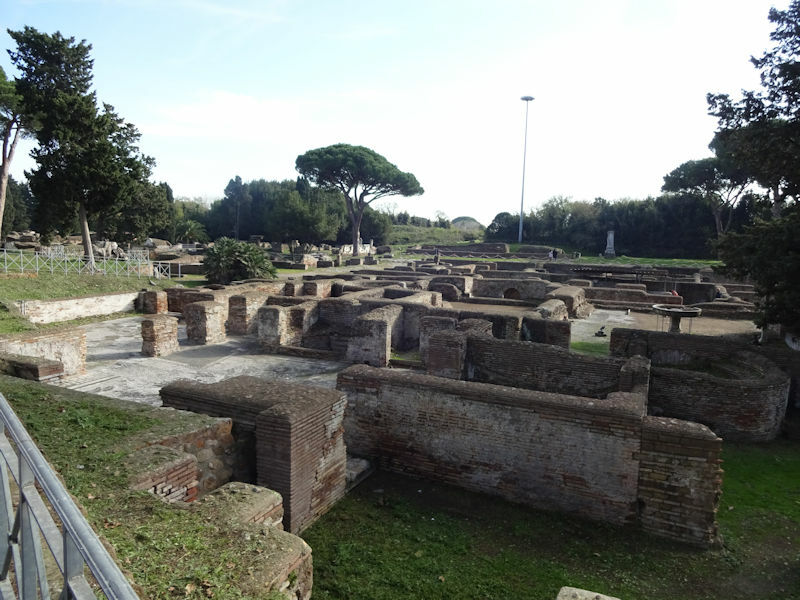 With time, as Rome's population grew and its overseas sources of grain multiplied, old Ostia became more commercially than militarily important, and a thriving riverside port developed during the 2nd century BC -- many ships could land here along the river, offload their cargoes to warehouses, and in due course reload them onto barges to be pulled up the river to Rome. In the absence of a better natural harbor, unfortunately, the largest ships had to lie off the coast and offload onto smaller ones first. 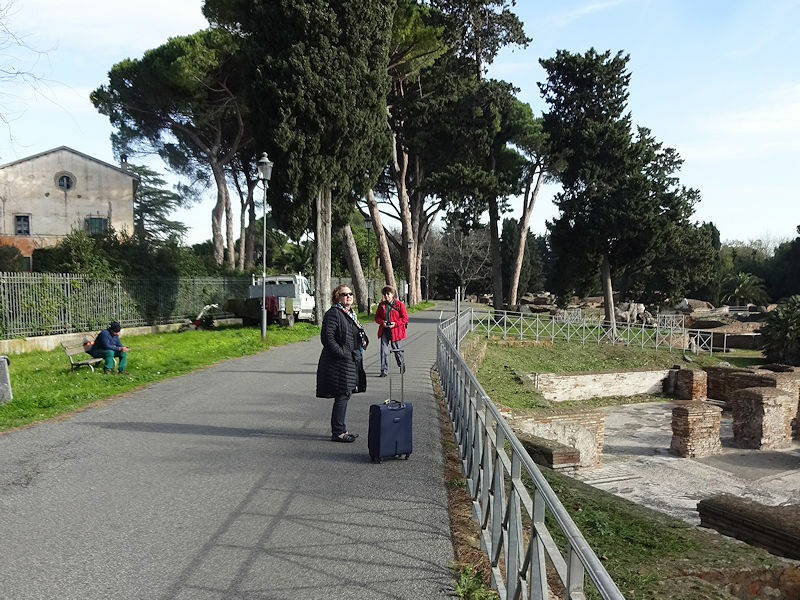 The basalt blocks of the Decumanus Maximus are too much for dragging a suitcase on, so we've transferred our cargo onto the modern service road that runs along nearby. 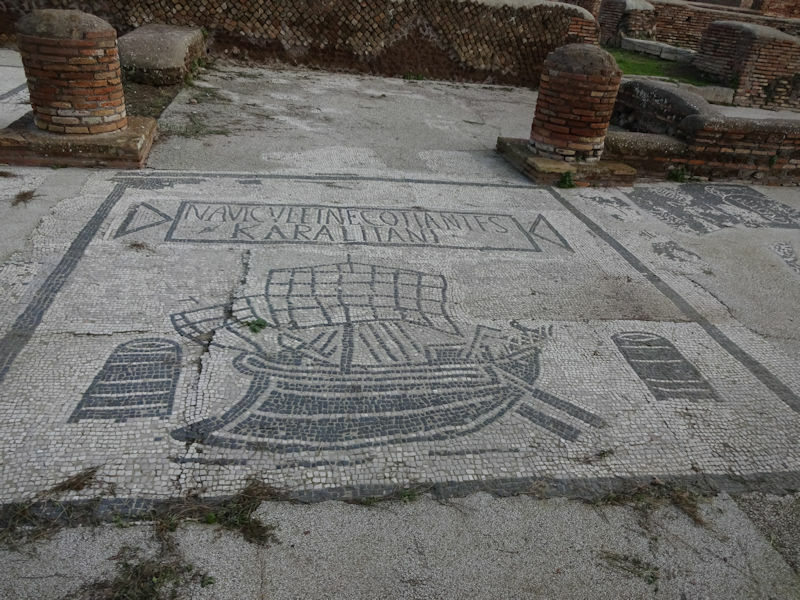 In the civil war between Marius and Sulla, in 87 BC Marius captured and plundered Ostia in order to cut off the chain of food supplies to Rome, and in 68 BC an organized pirate fleet sacked the town, burnt the port facilities, and destroyed the Roman war fleet -- in response, Pompey the Great cajoled the Senate into granting him the authority to raise an armed fleet and stamp out piracy; he rid the western Mediterranean of its pirates and their strongholds in 40 days, returned to Rome to get his command renewed, and then rid the eastern Mediterranean of its pirates in another 40 days. 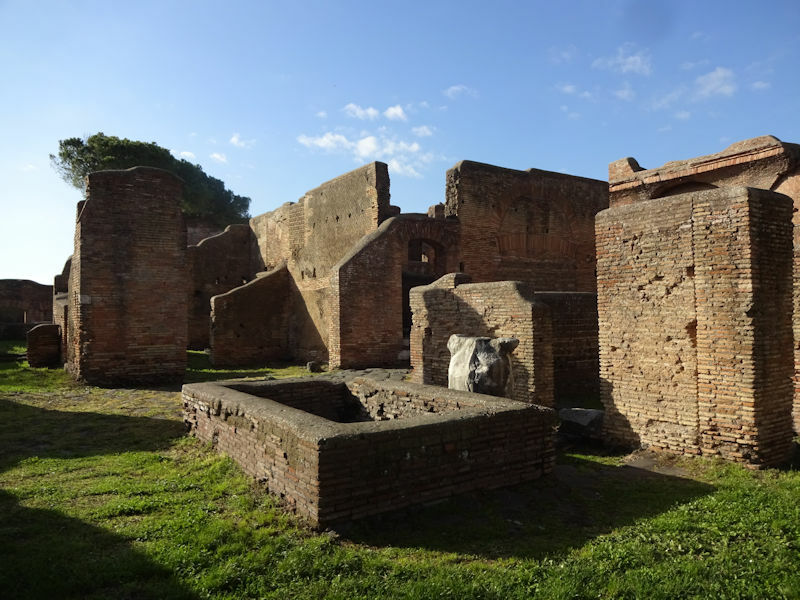 As a result of the pirates' devastations, in 63 BC, during his year as consul, Cicero the statesman and philosopher oversaw the rebuilding of the city with a proper set of defensive walls around it. 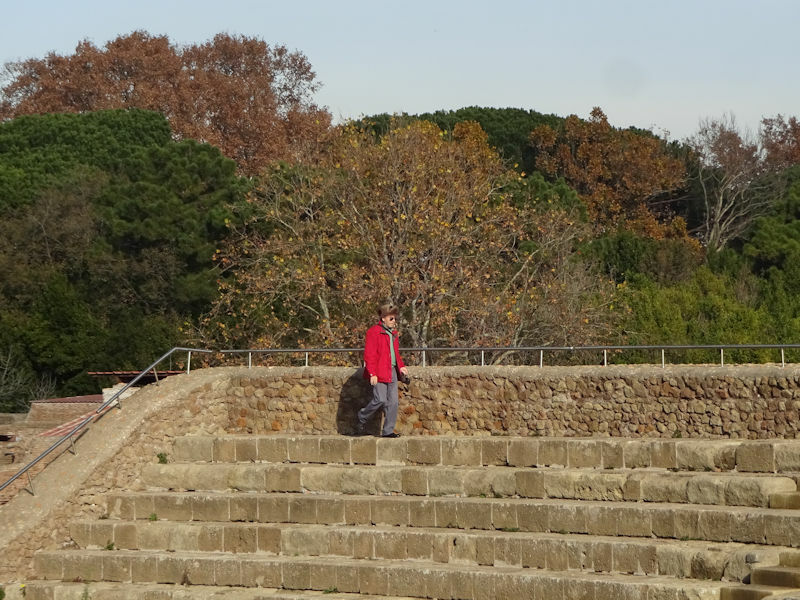 During imperial times, with Roman control of the seas, the walls were no longer considered necessary, and in Vespasian's reign, in the AD 70s, they were largely converted into aqueducts. Back towards the central main street, we're approaching the theatre. 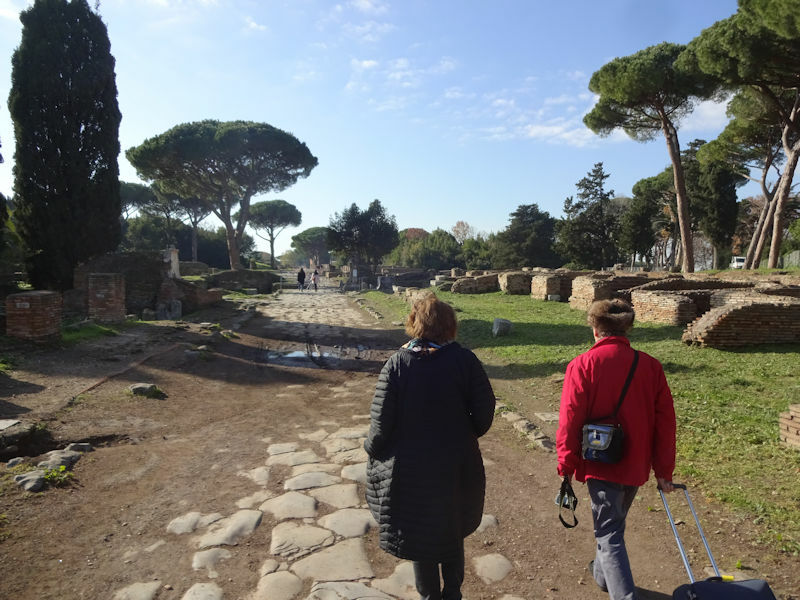 Kristin and Juan Carlos between the orchestra of the theatre on the left and, on the right, the Piazzale delle Corporazioni or Forum of the Corporations. 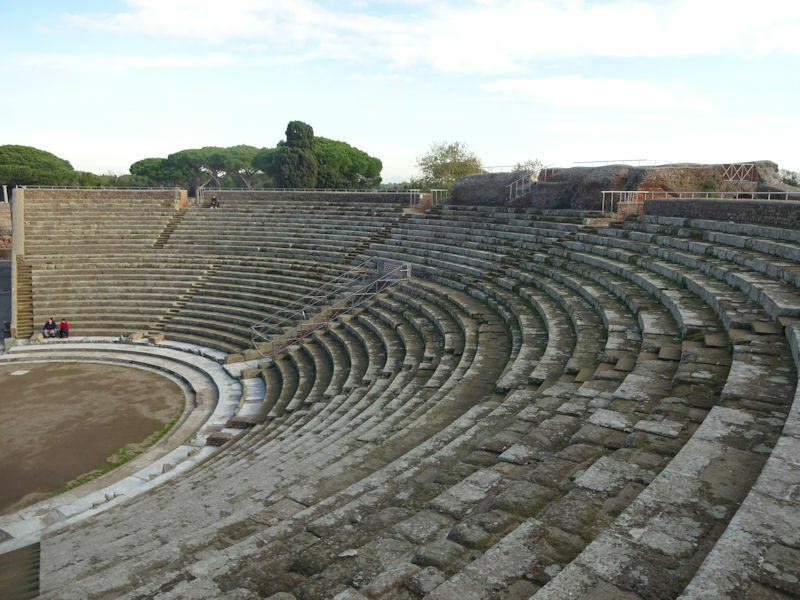 A first theatre was built here by Agrippa, the right-hand man of the Emperor, in the late years of the 1st century BC, along with the Piazzale delle Corporazioni at the same time. 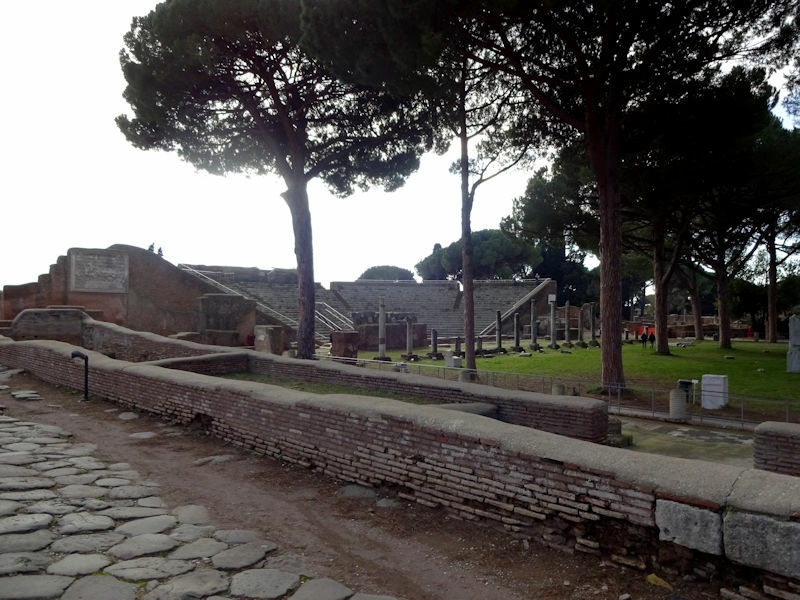 It was rebuilt of brick in the time of Commodus, before AD 192, and could seat 4,000. 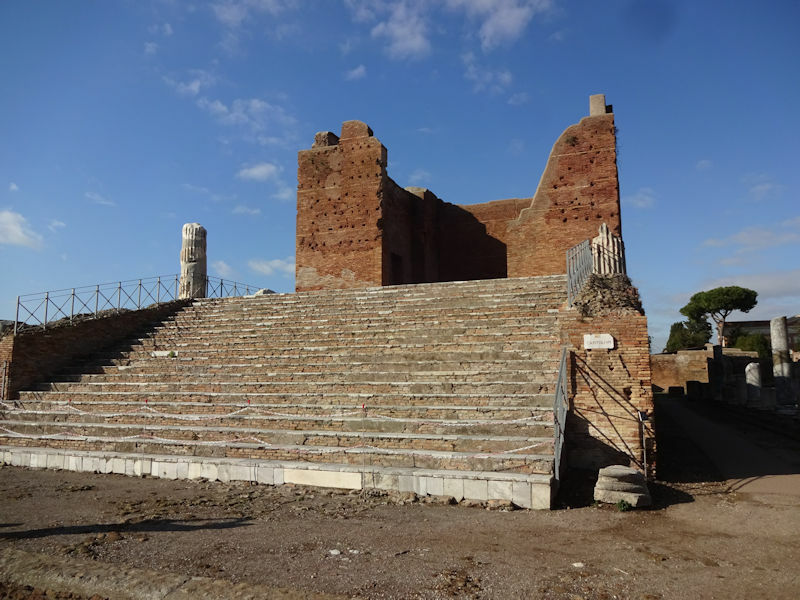 The three story scaenae frons before which plays and other events were staged is gone. 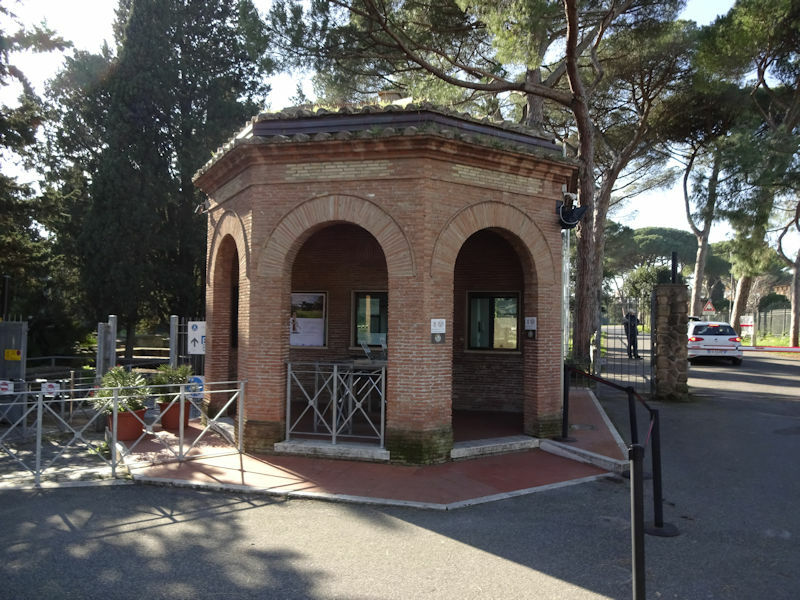 This is the large forum of the Piazzale delle Corporazioni, or Forum of the Guilds or Corporations, with a Temple of Ceres set in the middle, ready for your contributions. 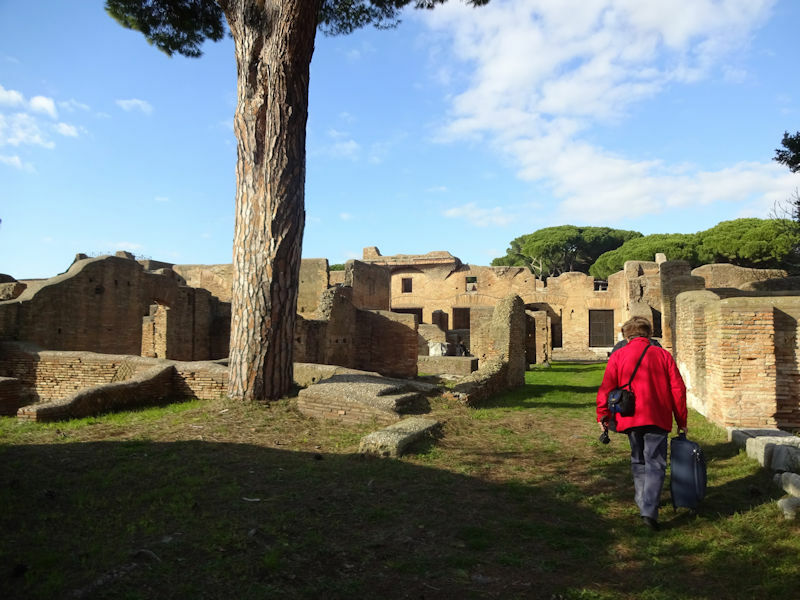 Along the huge rectangular Forum of the Guilds. 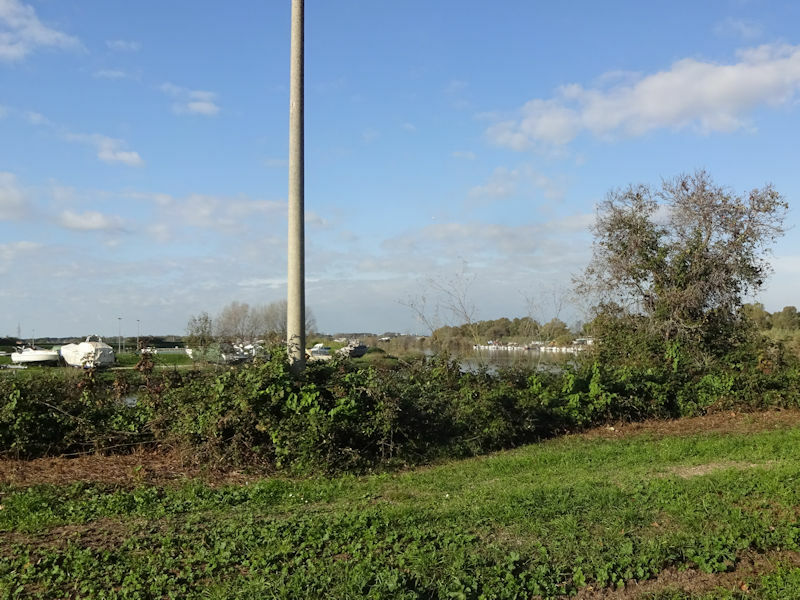 Here there were some 64 offices belonging to traders and shipowners, where prospective importers and exporters could come along and make arrangements for the purchase, shipping, transshipping, or warehousing of their goods. 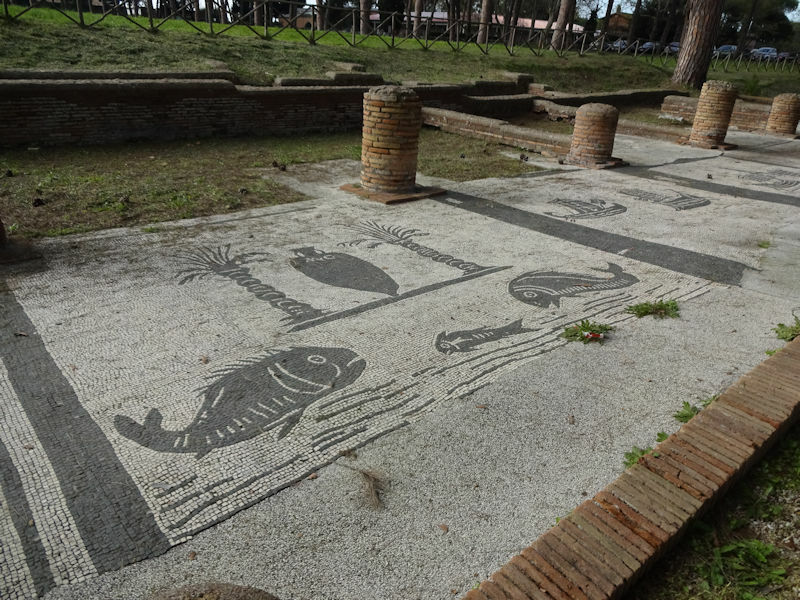 The 2nd century mosaics in front of each establishment indicated the nature of the business, from fish to ships . . .
. . . to elephants, which apparently indicated traders from Africa. Other symbols declare the foreign destinations represented by their agents here, like this: 'shippers and traders Karalitani', i.e. from Karalis or Cagliari, Sardinia. 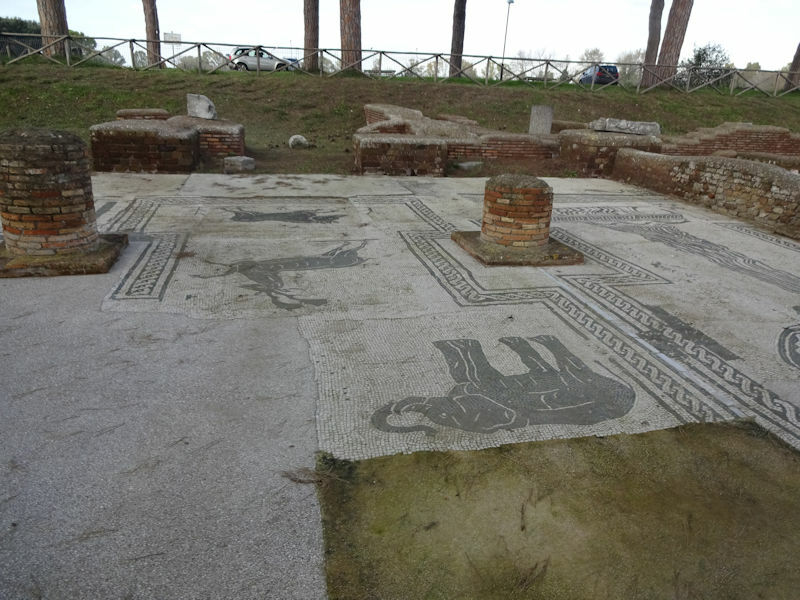 These are just a few of the guild mosaics, many or most of which seem to have survived in place, though others from around Ostia have ended up in various museums (including the museum here). The museum has thoughtfully provided a tactile example with an explanation in braille. 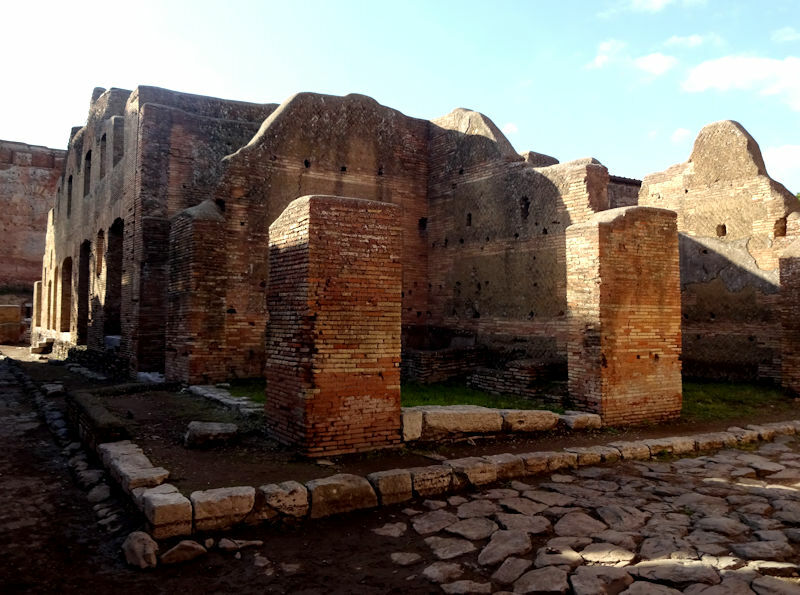 The Forum of the Corporations. 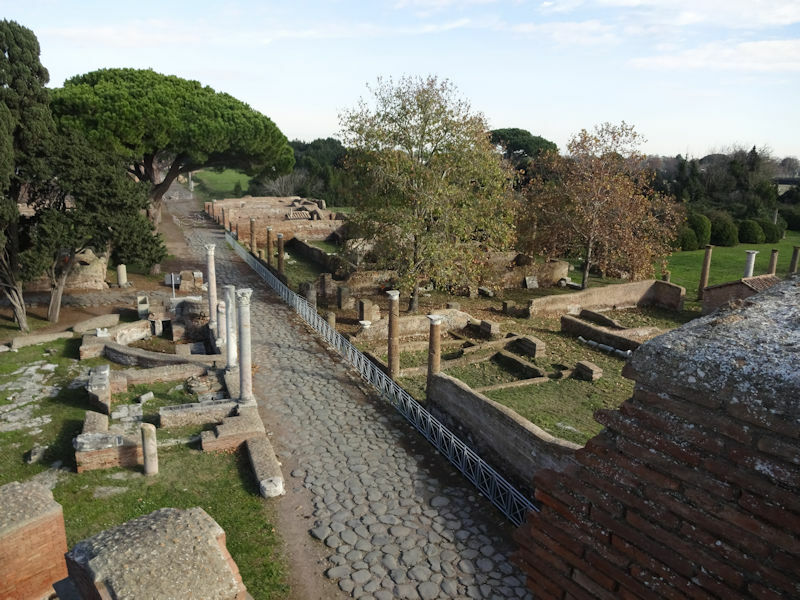 The 2nd century AD seems to have been the apogee of the city's prosperity, with its population, according to some estimates, reaching nearly to 100,000. But with increasing needs for the importation of grain and other staples, and the appearance of larger ships for long-range trading, improvements were required, and around AD 46 the Emperor Claudius ordered up a new port facility, cleverly called Portus and boasting its own lighthouse and two breakwaters to enclose the harbor, at the mouth of the northern branch of the Tiber, near the present Da Vinci Airport, and Trajan extended that inland to a freshly-dug hexagonal basin connected by canals to Portus and to the Tiber, in AD 103. 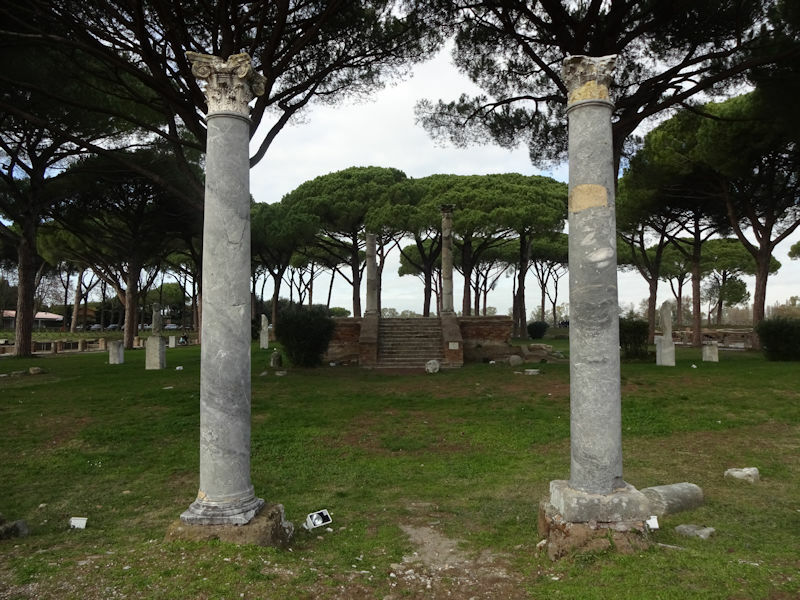 The new facilities increased Ostia's prosperity at first, but inevitably over time, especially after Constantine separated Portus as its own city, the commercial traffic through Ostia began to decline. 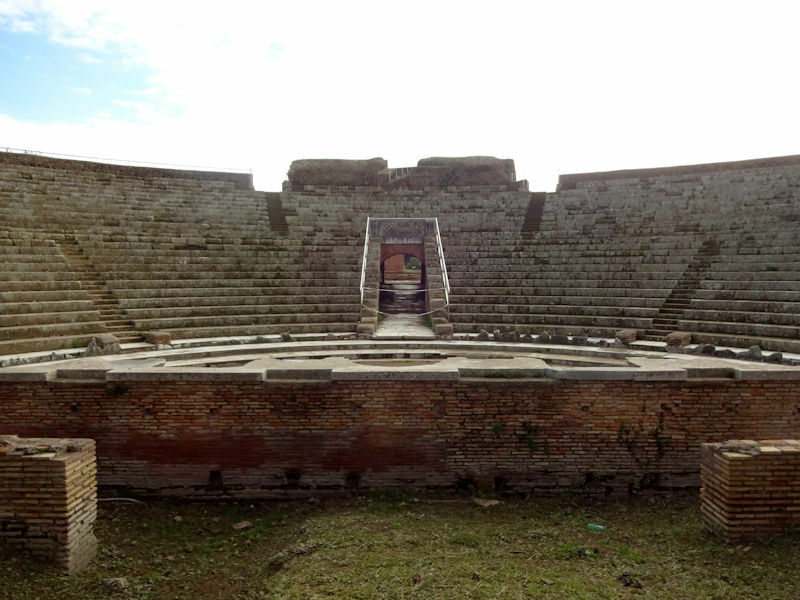 A closer look at the theatre, said to be the first or one of the first Roman theatres built in brick -- which may be why so much of it has survived, since most of Ostia's marble was scavenged for the palaces of Rome and the cathedrals of Pisa, Florence, Amalfi and Orvieto. The theatre is still a favored venue for concerts and spectacles. 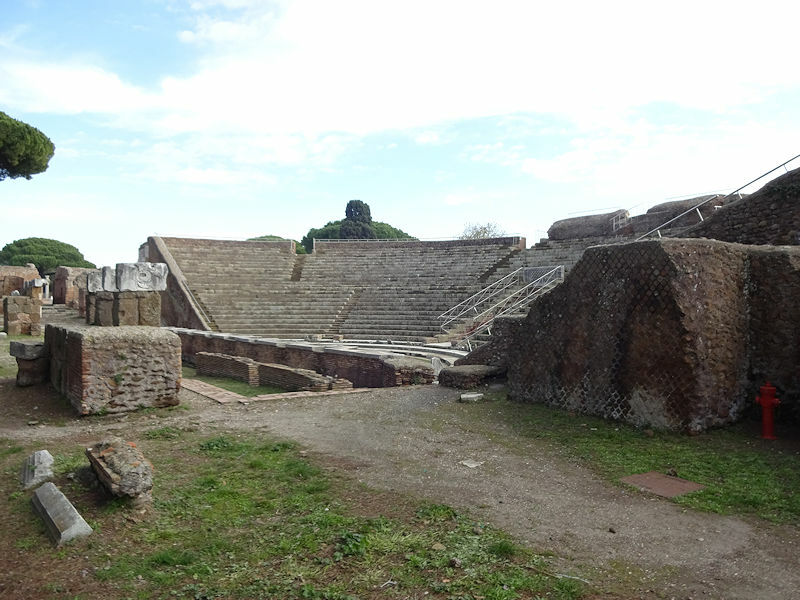 The orchestra below and remains of the scaena building. Juan Carlos who, in addition to being a translator for UN agencies and, over 20 years, frequently my colleague in translating for the Ramsar Convention, is also a serious photographer, here looking for the perfect shot. 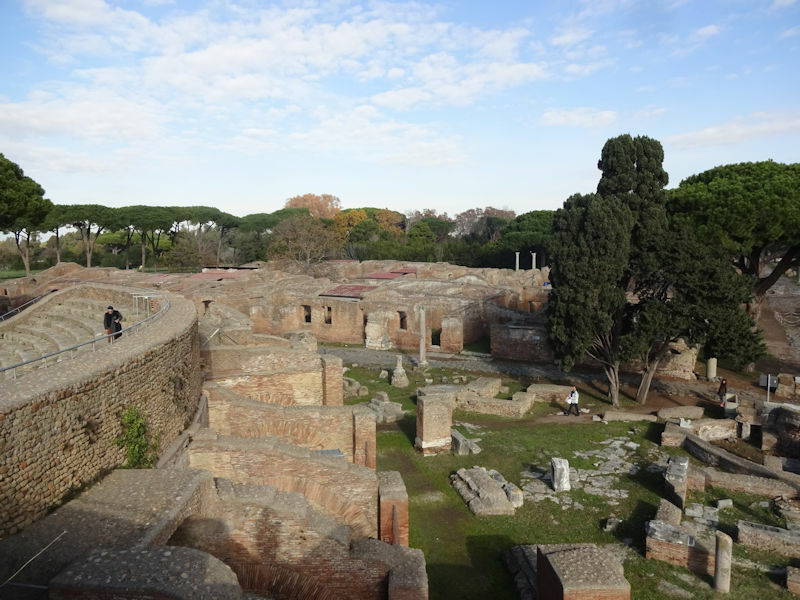 The Terme di Nettuno or public baths of Neptune from the top of the theatre. 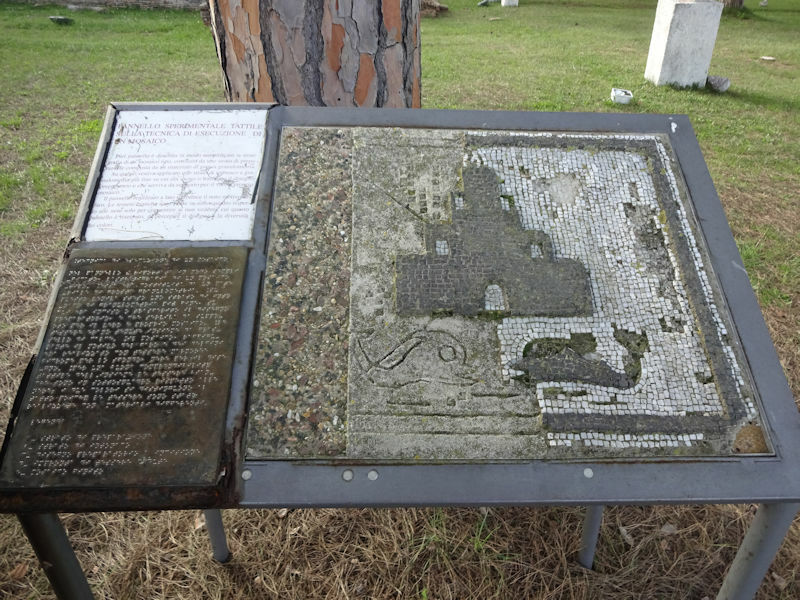 At the lower right are the remains of a Christian chapel built to commemorate the execution of 18 Christians on that spot in AD 269. We're not even half-started yet. 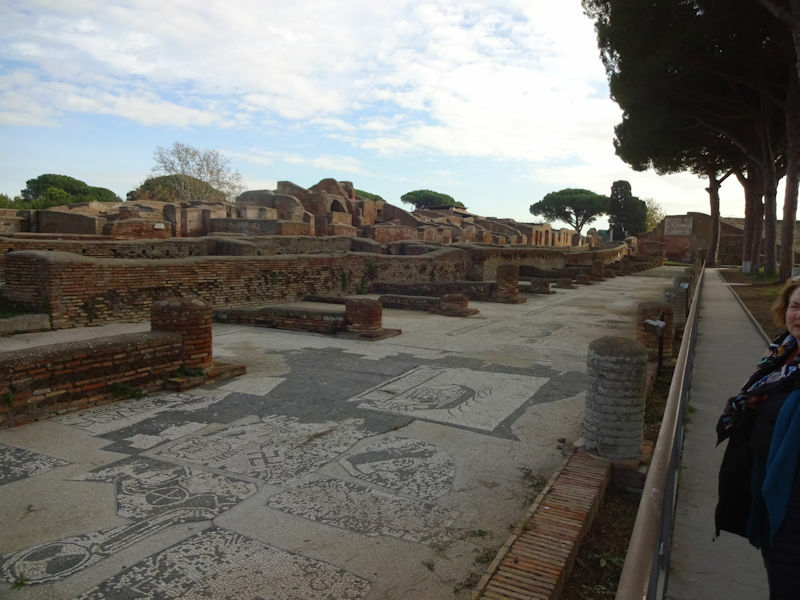 In the late 3rd and 4th centuries, Ostia declined considerably amid the chaos in Rome at the time; the damage from earthquakes in 238 and 346 appears never to have been cleared away or rebuilt. 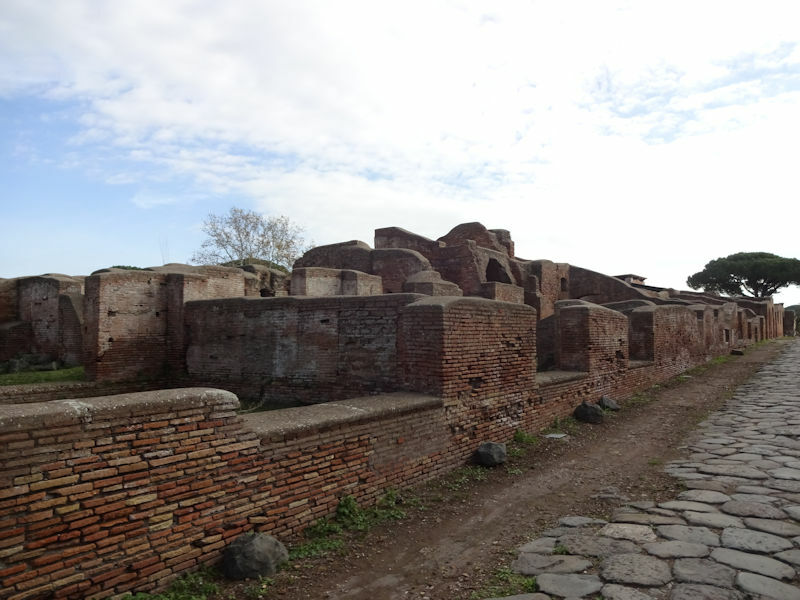 With time, the commercial trading functions of Ostia declined -- the riverside facilities were abandoned and rubble was piled high along the banks to create flood protection for the residential areas of town. 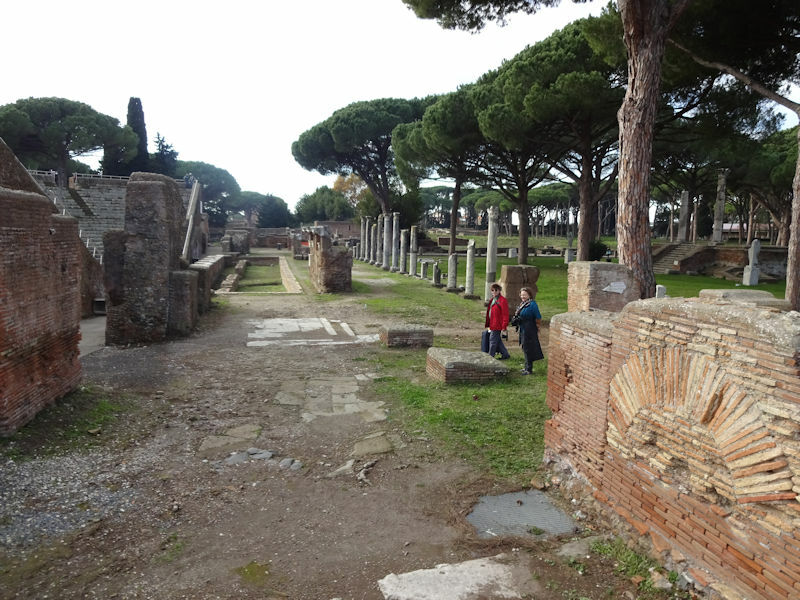 In 410 Alaric's Visigoths sacked Portus as well as Rome, but skipped Ostia, and when Gaeseric's Vandals from North Africa sacked Rome and Portus in 455, they too seem not to have bothered with Ostia. 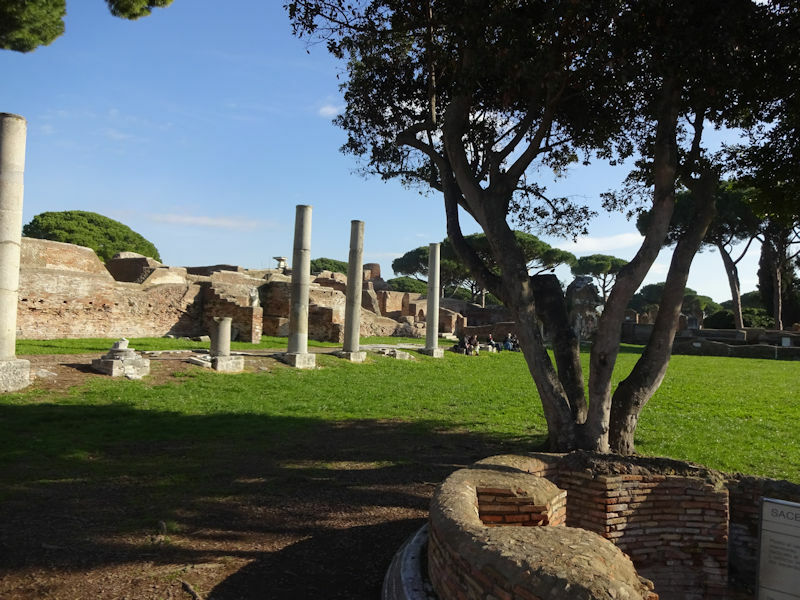 Belisarius defended both Portus and Ostia from Vitigis in 537, during the Gothic Wars, but sometime thereafter the last Ostians walled up the entrances to the theatre and were living in it as a jury-rigged fortress. 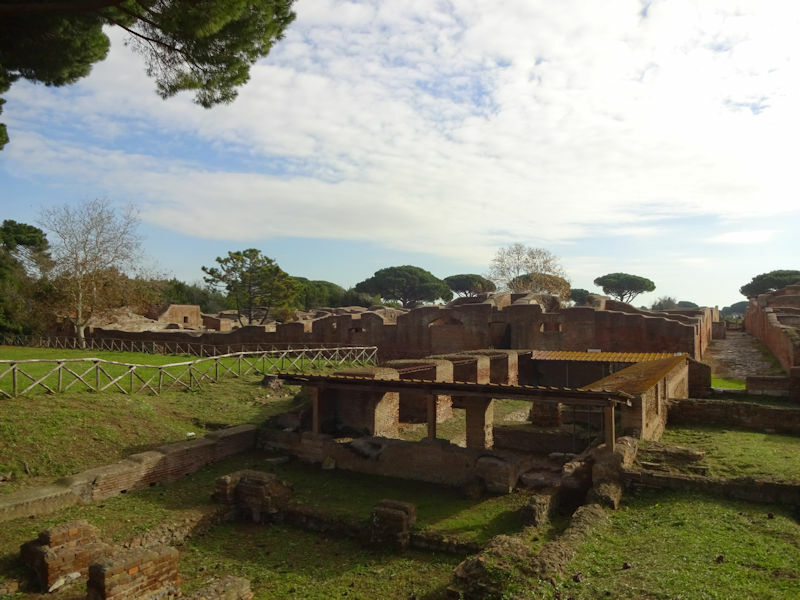 "An example of high-density housing" (from the information panel) at the height of the city's population boom, the 2nd century Casa di Diana stood three stories high with rooms around a central court, with a communal fountain. 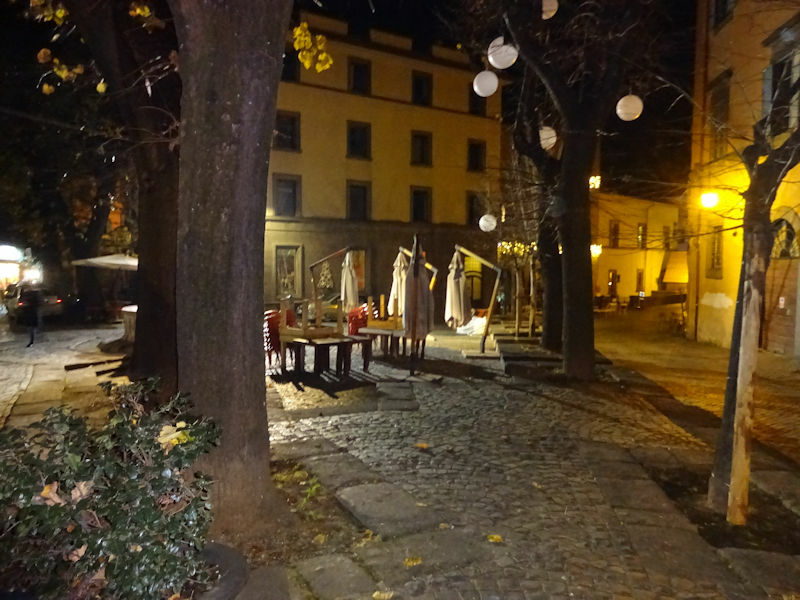 Taverns and shops were included on the ground floor. 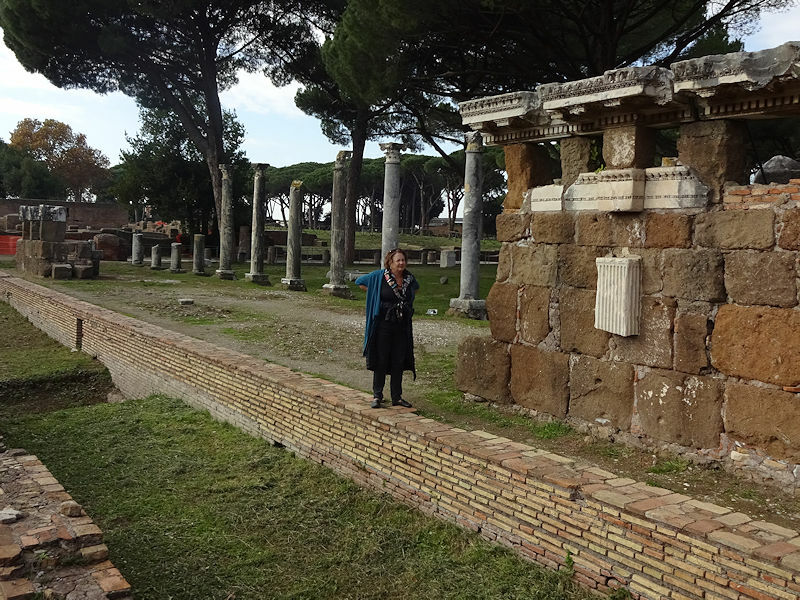 Standing in the Forum, facing the Capitolium, a 20m high temple, built in about AD 120 and now thought to have been dedicated to the Big Three Roman gods, Jupiter, Juno, and Minerva, and modeled on the temple of Jupiter Capitolinus on the Capitoline hill in Rome. 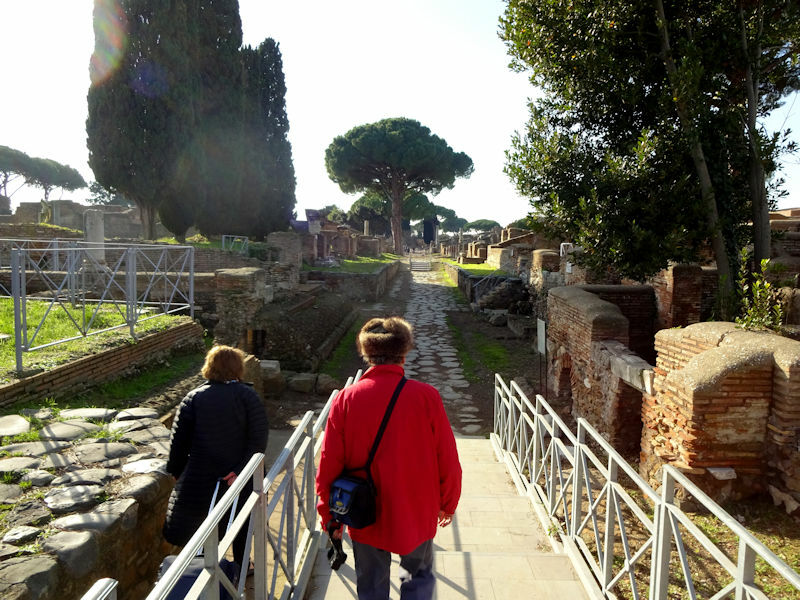 The Cardo or main north-south road led from the docks on the river directly past the temple to here in the Forum. 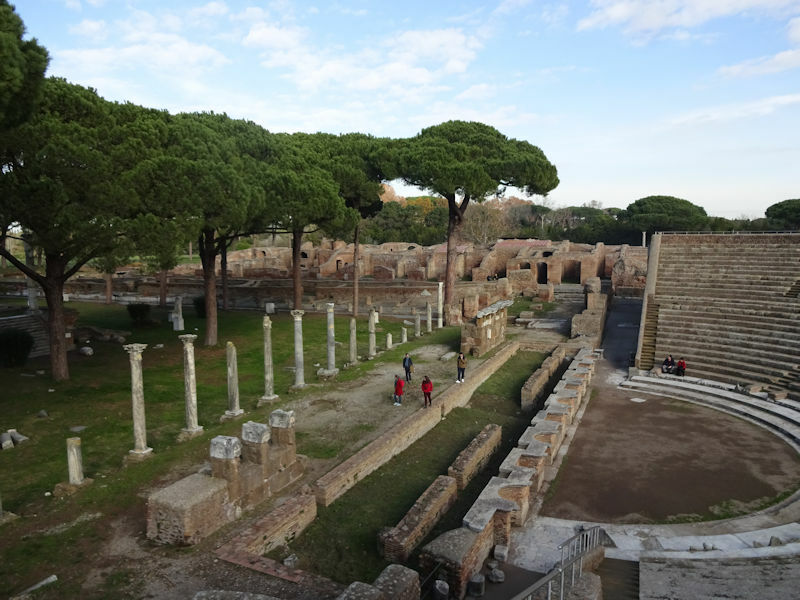 The Forum was built by Tiberius in the early 1st century but revised in the 2nd century when buildings were demolished to build the Capitolium. 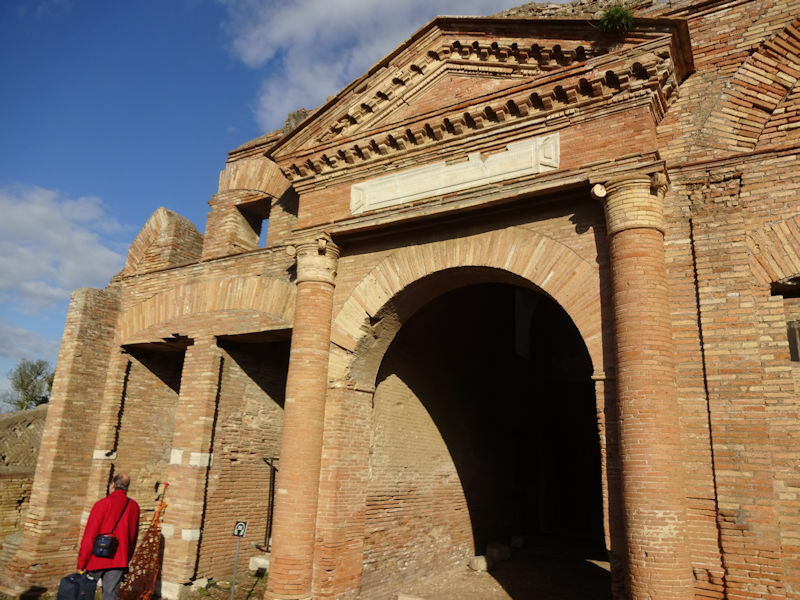 A little farther along the main street, this is the "Round Temple" from the mid-3rd century, the last temple to have been built in Ostia; it's thought to have been an Augusteum, or temple to the deified emperors. 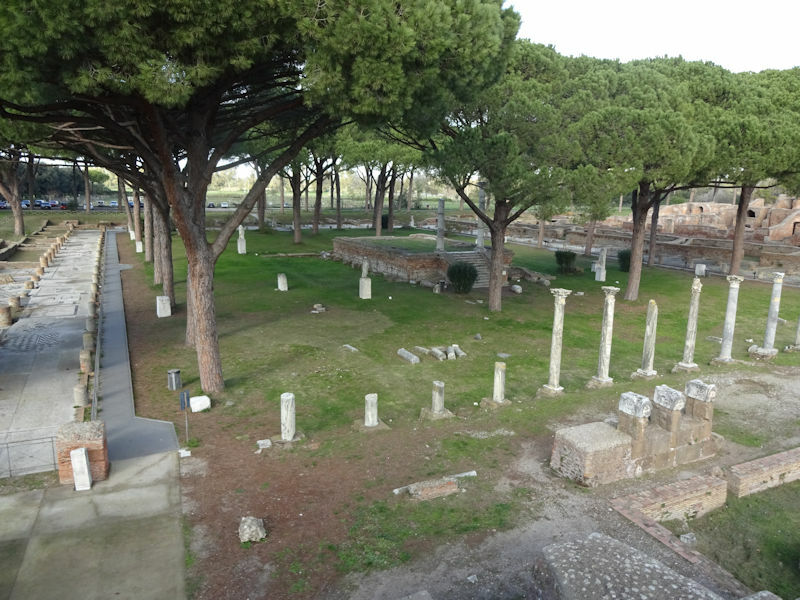 Ostia seems to have become an episcopal see at least by the early 3rd century, when the names of bishops have been recorded, though the site of their cathedral is unknown. 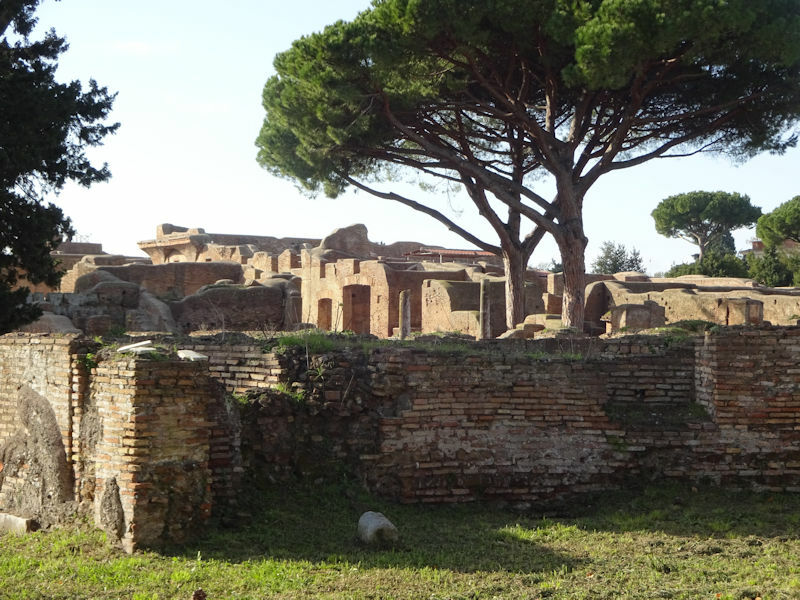 In the early 4th century the Emperor Constantine ordered a basilica and baptistery to be built here, the "Basilica Constantiniana" (which has been entirely gone, its materials scavenged, since about 900), and from 336 onward the Cardinal-Bishop of Ostia has frequently been privileged to consecrate new popes who were not already bishops themselves (though Ostia's bishops were soon residing in Rome instead of Ostia). 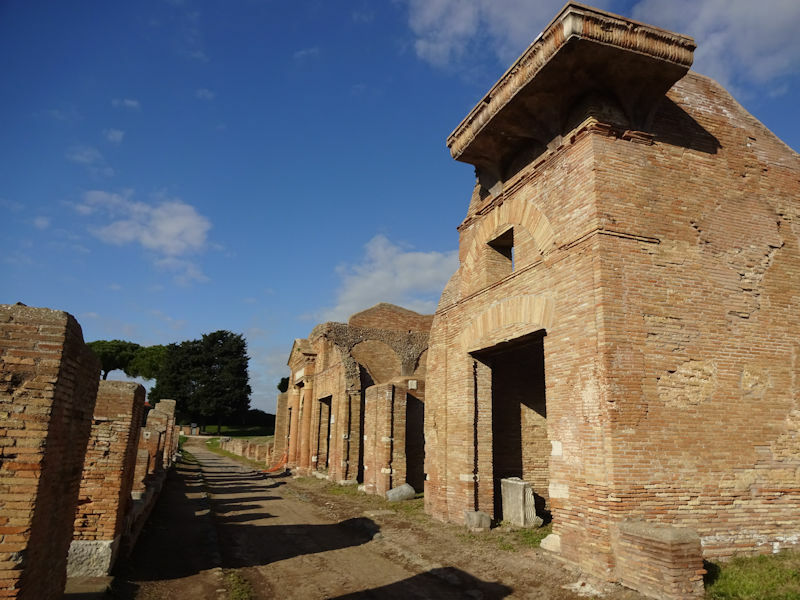 The present cathedral, Sant'Aurea a Ostia Antica, is located outside the "Scavia di Ostia Antica" (the excavations, where we are now) in the town that grew up from the new town of Gregoriopolis, later renamed just Borgo di Ostia Antica, and was completed in 1483 like the Castello di Giulio II. 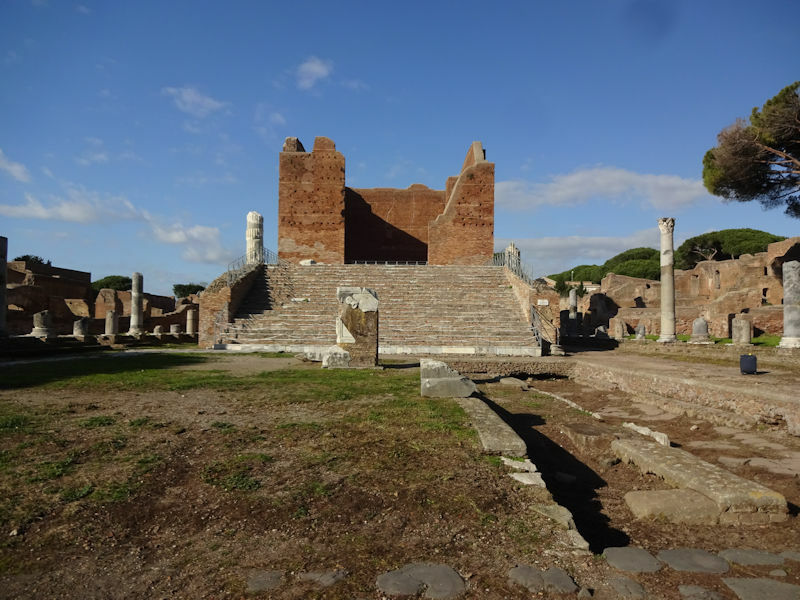 It was evidently built on the site of a paleochristian church dedicated to Ostia's patron saint, St Aurea, a mid-3rd century martyred noblewoman associated with some entirely unreliable miracle traditions. 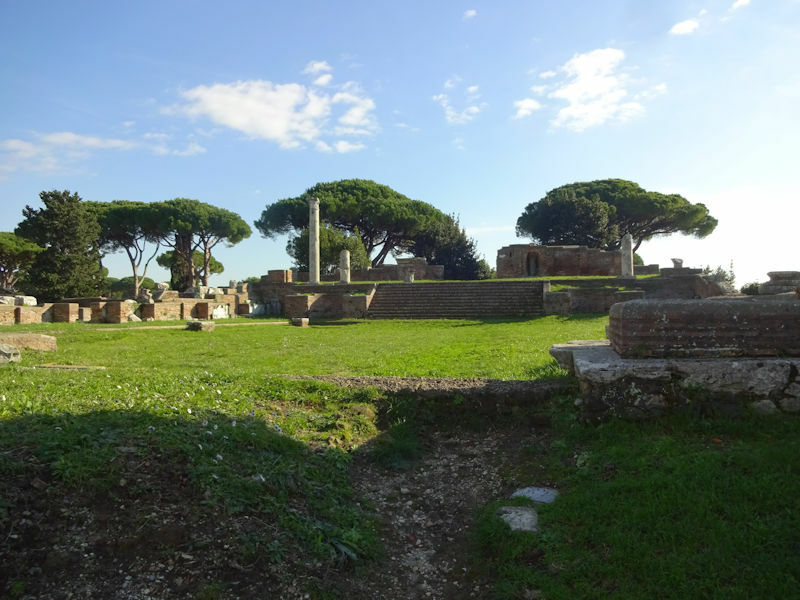 When St Augustine, his son, and his mom St Monica were returning to Africa in 388, she died in an inn in Ostia, and her remains were said to have been buried in that church before being translated to Rome. 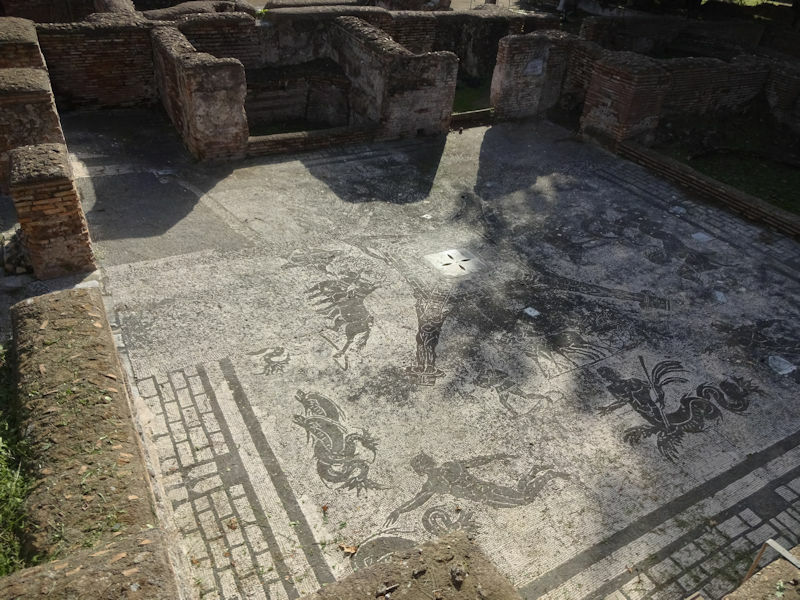 These are part of a vast warehouse complex, one or all of them referred to as the "Horrea Epagathiana and Epafroditiana" as above. 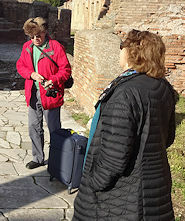 Now, with 4 or 5% of the good Roman stuff contemplated and reflected upon, we have to leave, because it's time for a hasty lunch in the museum cafeteria and the long road home. The mighty Tiber, arising in Emilia Romagna in the Apennines, idles lazily past us in Ostia Antica. 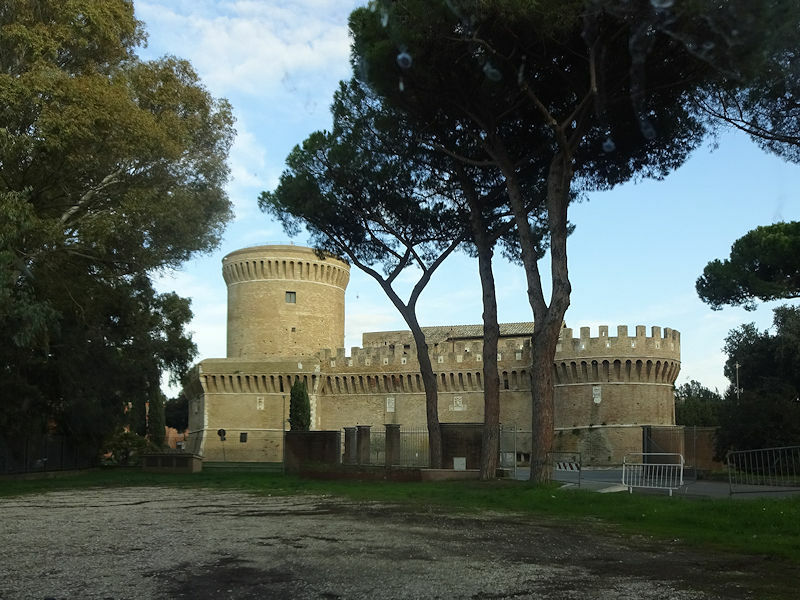 Fortified by a brief cafeteria lunch, on our way out of town we're passing the nearby Castello di Giulio II. 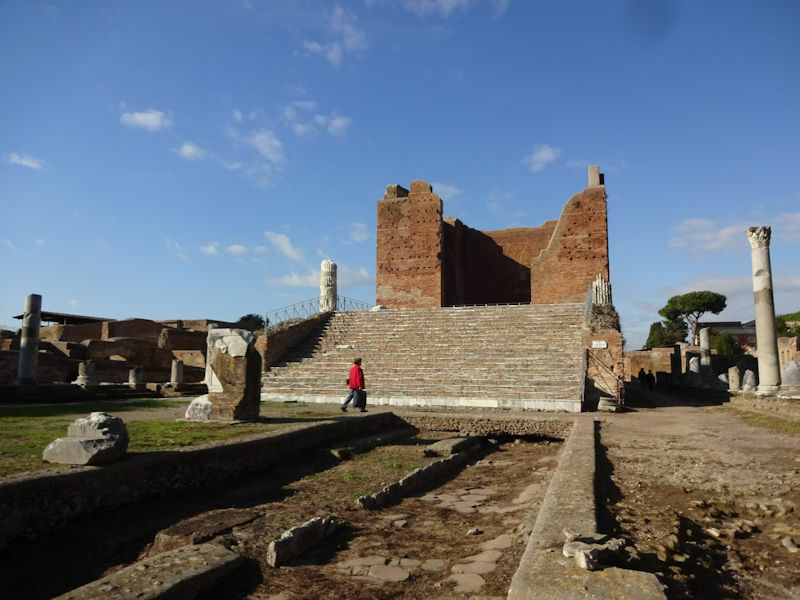 In 1483 the Cardinal Giuliano della Rovere (later Pope Julius after 1503 ), tasked with responding to Turkish raids of the Roman coastal areas, built this classic triangular castle to defend Gregoriopolis, ripping all the materials off the mostly abandoned Ostia Antica. 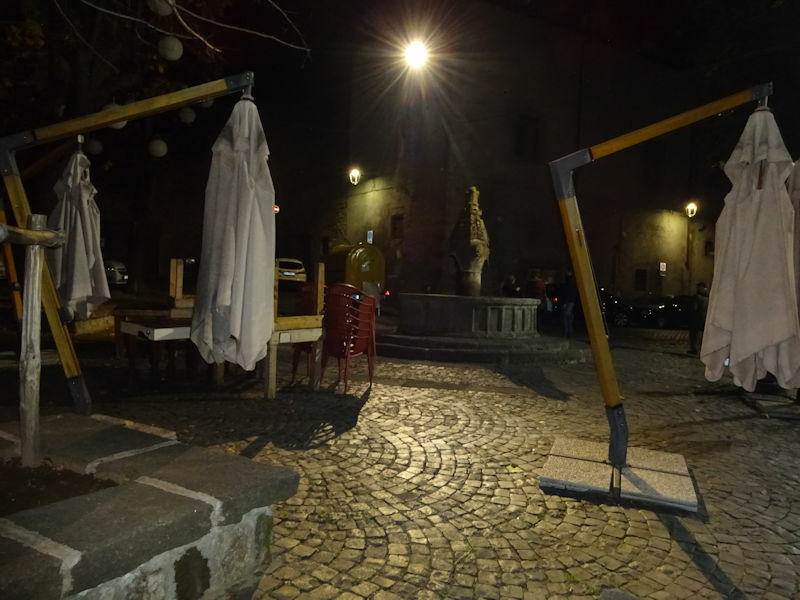 A flood in the late 16th century changed the course of the Tiber and turned this area into a malarial swamp, and the town and castle were abandoned. 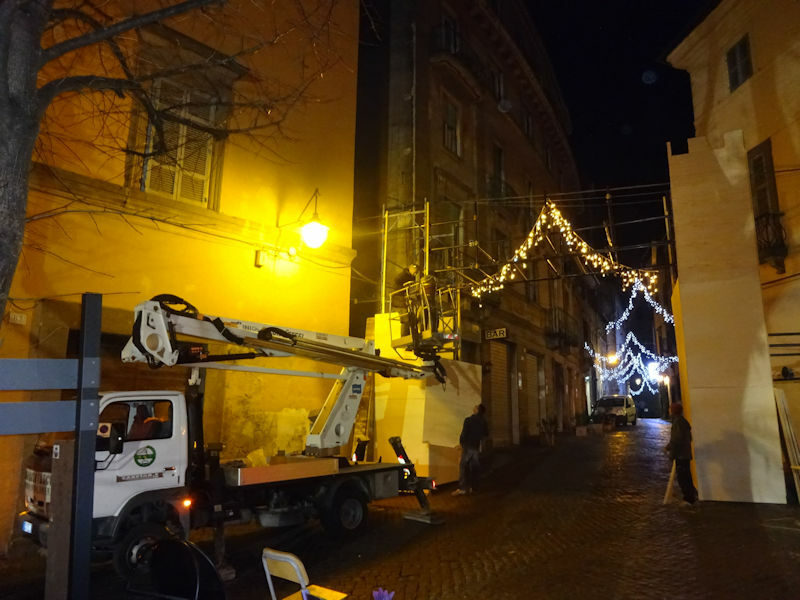 Back in Viterbo, on a postprandial stroll around town, this is the Piazza delle Morte where . . .
. . . workmen are laboring late to erect a castle gate for tomorrow's Christmas market festivities. 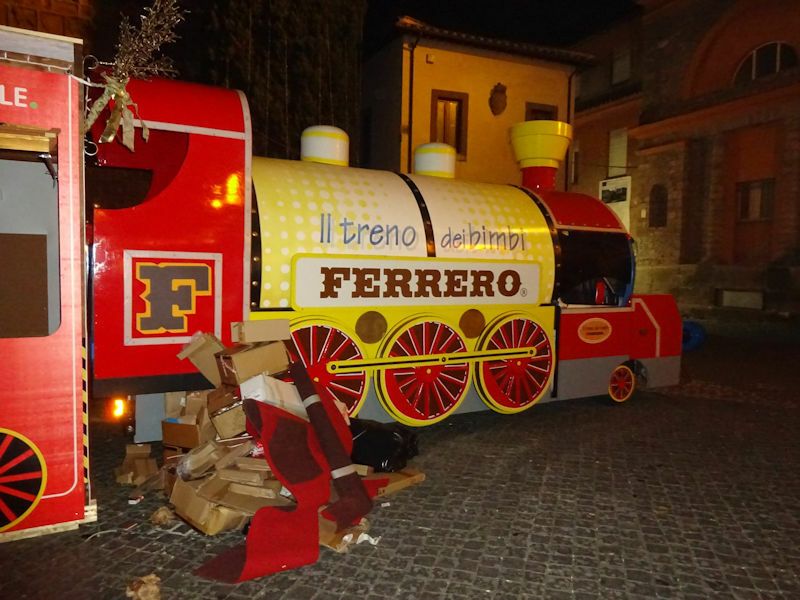 Promotions for the kids, this by the kids' candy company Kinder Egg made by the Ferrero firm. Feedback and suggestions are welcome if positive, resented if negative, . All rights reserved, all wrongs avenged. Posted 5 February 2017.